Laid out in 1771 with a modified version of Oglethorpe’s “Savannah Plan”, Brunswick has worked hard in recent years reclaiming as many of its historic squares as possible. Hanover Square is the jewel in the crown, being the least altered of the original squares. 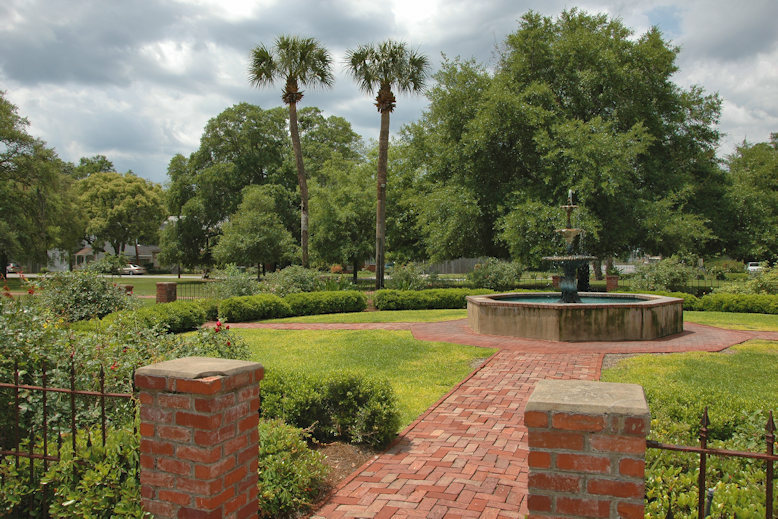 A non-profit preservation group, Signature Squares of Historic Brunswick, actively promotes these public parks and is engaged in ongoing research to restore them. Of Hanover Square, they note: [It] is one of the two large squares in Old Town Brunswick that retains its original size and shape. It was named to honor Britain’s ruling House of Hanover during the reign of King George II, when the Colony of Georgia was established. Initially, Hanover Square was the hub of official city and county business. The county courthouse, jail and stockyards were located in the square until the late 19th century. As Brunswick grew and prospered, its citizens began to feel that the muddy, trampled stockyard and shabby wooden buildings did not represent an up-and-coming city properly. In 1882, the Ladies Park Association campaigned for the removal of the courthouse from Hanover Square and raised funds to purchase materials to beautify the area, which was referred to as “Hanover Park.” The city drilled a deep artesian well, topped with an ornate fountain, that yielded water rich with minerals that were thought to be therapeutic for certain diseases. When the projects were completed in 1885, the park’s title was returned to the city. For decades, Hanover Square was the heart of public gatherings in the city. Church socials and concerts in the bandstand filled the evenings with laughter and music. The gardens were expanded and modified to reflect landscape tastes of each era. Brunswick’s residents stood guard over Hanover Square numerous times when transportation projects threatened the integrity and boundaries of the historic space. In the mid-20th century, the city’s population growth trended northward and Hanover, like other original squares, fell into decline. As Signature Squares was organized to save the parks and squares within the Historic District of Brunswick, Hanover Square became its first project. The fountain was restored, walkways were replaced and the rose garden was replanted. More work is planned for the future to return the square to its full glory.